With very strong trade winds blowing and continuing dry conditions, be on the Wildfire Lookout! and evacuate early. Six homes were evacuated on the makai side of Hana Highway on Maui for a fire that came to within five feet of the homes. 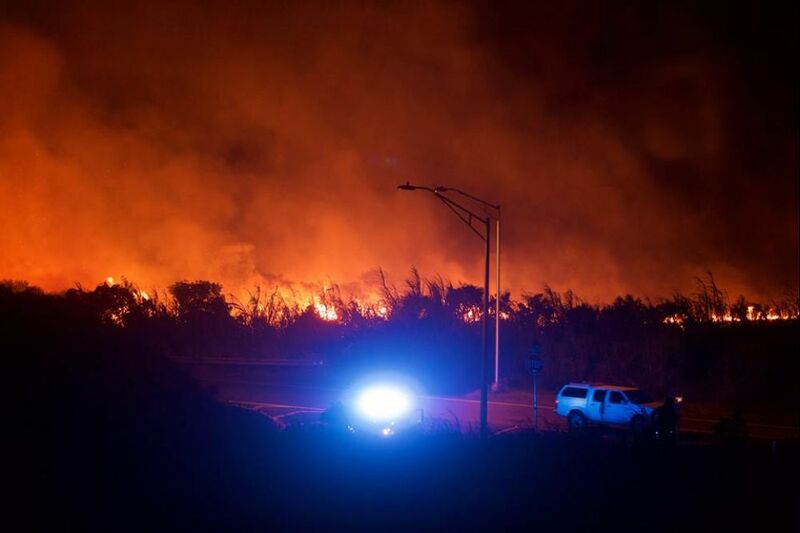 "Forty-two minutes after the Pāʻia fire was extinguished, crews responded to reports of a brush fire makai-side of Hāna Highway at the Ha‘ikū Road intersection at 6:32 p.m. When Pāʻia crews arrived 10 minutes later, a half acre of land was already scorched. 'Crews had just left the scene of the Pāʻia fire and didn’t even make it back to the station when they responded to the second fire,' Chief Taomoto said." 'When you’re in an open field with nothing going on, you start eliminating the potential igniting sources—structures and power lines, human habitation—and you come up with nothing, so there is the potential human cause and someone fled the scene,' he said. Chief Taomoto said if the conditions are right and multiple factors line-up perfectly something as simple as a cigarette thrown out of a window could start some of the roadside fires. However, he said it’s suspicious when there are multiple fires within a small area, he used the three small grass fires off the Pali last month as an example."